Cheesy, garlicky Pasta Primavera Alfredo for Two in just 20 minutes? The only downside is that there may not be any leftovers! 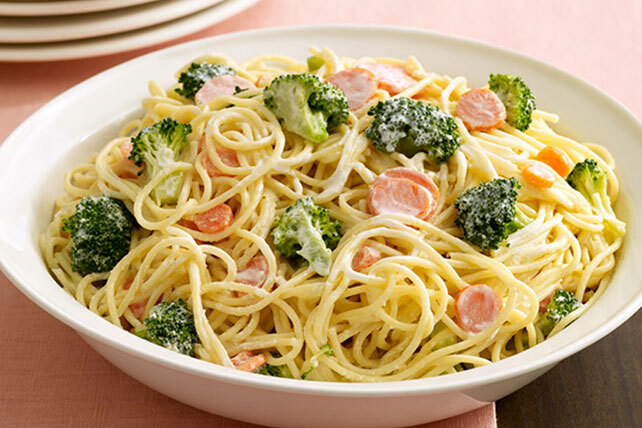 Cook pasta in large saucepan of boiling water as directed on package, adding vegetables to the water for the last 3 min. Meanwhile, melt butter in medium saucepan on medium heat. Add garlic; cook 1 min., stirring occasionally. Add milk and cream cheese; cook until cream cheese is completely melted and mixture is well blended, stirring frequently. Stir in Parmesan. Drain pasta mixture; return to saucepan. Add cream cheese sauce; mix lightly. Sprinkle with additional shredded Parmesan cheese just before serving.